Some of the masks currently displayed at Mongoose Junction. St. John residents have two more opportunities to let their creativity flow in the company of fellow community members as they participate in an island-wide public art project. Two more Mask Making Workshops will be held starting at 6 p.m. on Friday, July 20 and Saturday, July 21, at the PoP-Up exhibition space in Mongoose Junction, across from Little Switzerland. 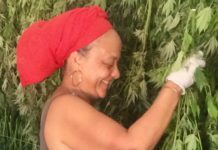 Grandmothers have been doing it. Little children have been doing it. Artists have been doing it. And people like me, who haven’t picked up a paintbrush for the purpose of self-expression since 8th grade, are doing it. The sponsors of this project have provided all the materials — blank masks of several varieties, paint, beads, shells, feathers, trinkets of all sorts. You get to come and decorate a mask as the spirit moves you. At the workshop I attended, some people arrived with virtually nothing in hand and no plan in mind. 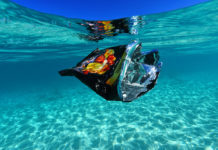 Others brought materials they wanted to use — pieces of multicolored yarn, a plastic insert used to maintain the shape of a snorkel fin found on a beach, and shards of a favorite bowl smashed to bits during Hurricane Irma. Priscilla Hintz Knight displays the mask she wore in this year’s STJ Festival Parade, with masks made by JESS students in the background. Remnants of the storm fit in especially well in this endeavor. 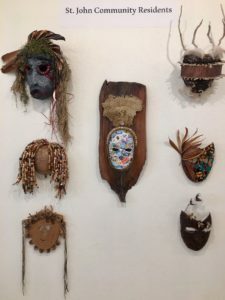 The project, entitled “Mask Making as a Tool for Community Expression and Healing in the Aftermath” was conceived as a form of art therapy for the entire community following Hurricane Irma. At some of the workshops, people have shared their hurricane stories as well as artistic advice. 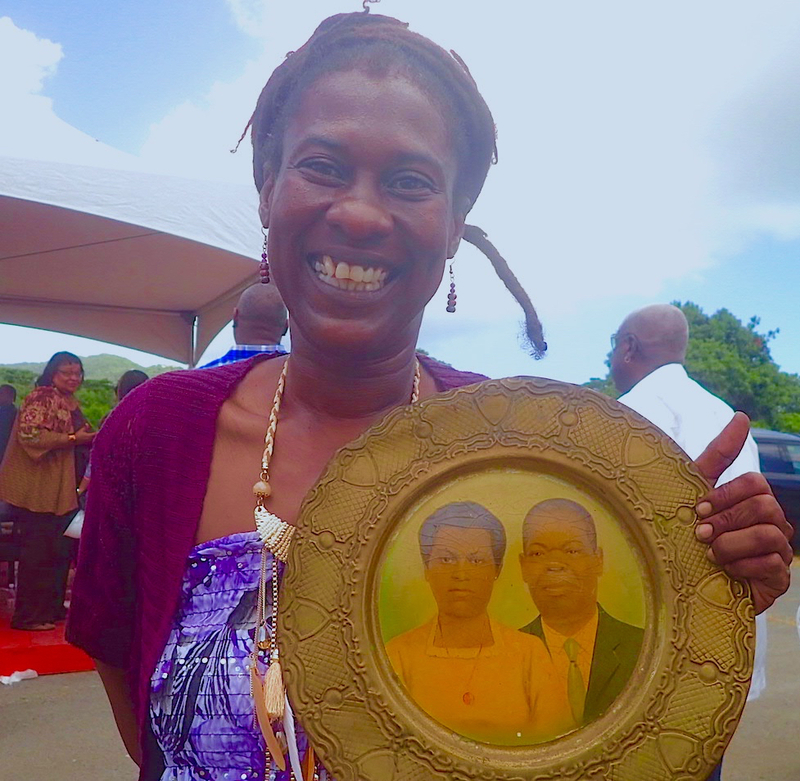 Mask-making and masquerading have a long tradition in the Caribbean, with roots going back for centuries to Africa and Europe. 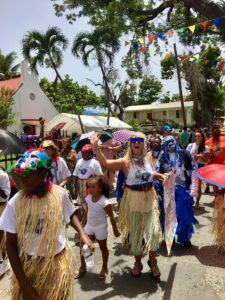 In the St. John carnival parade held on July 4, children wore the masks they made as part of this project, along with traditional rafia adornments. 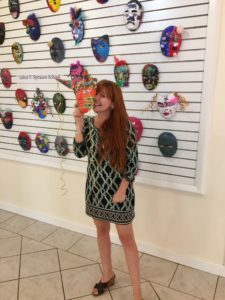 Art teacher Angela Warren encouraged the children from the St. John School of the Arts to make masks that explored the duality they faced as both survivors of natural disaster and celebrants at a cultural festival. Since the project began in June, more than 300 masks made by community members have been put on display. (The masks are displayed anonymously, in keeping with the tradition of allowing their creators to imagine new identities and selves.) Hintz Knight thinks the project’s designers might meet their goal of collecting 500 masks by July 28. That’s the day members of the public are invited to come and help choose 45 masks to send to Washington, D.C., where plans are underway to stage another exhibition in October. In the meantime, everyone is invited to view the masks at the National Park Visitors Center in Cruz Bay between 8:30 a.m. and 4 p.m. every day, and at the pop-up space in Mongoose Junction II from noon till 6 p.m. Mondays through Saturdays. At Mongoose Junction, volunteer docents are on hand to talk about the project and share materials on traditions of masquerading. 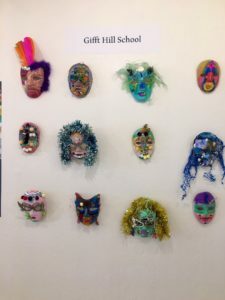 Masks made by students at Gifft Hill School. Individuals who want to submit a mask without attending a workshop are welcome to do so until July 28, said Hintz Knight. Hintz Knight wished to thank sponsors Topa Properties Ltd., which donated the space for the exhibit, Mongoose Junction, Guardian Insurance, and the St. John Community Foundation. She also thanked the Arts & Culture Recovery Committee of St. John (ACRC) which includes such organizations as The St. John School of the Arts, JANCO, and the Gri Gri Project.